Imaging a light pulse? – Physics says what? Lihong Wang will discuss the development of photoacoustic tomography, which allows scientists to peer deep into biological tissue. He will also talk about his lab’s development of compressed ultrafast photography that records 10 trillion frames per second. I came across some articles recently that ultrafast photography reached a point where a light pulse can be imaged. I was interested because in the past claims were made that atomic events — like photon emission — were instantaneous or essentially so because such events were too fast to ever image. Well, that may change. And there are signs that “quantum leaps” do indeed take a slice of time (so there is some physical process in space-time). These demonstrations, like in most entanglement correlation experiments, are post hoc visualizations of assumed identical events repeated trillions of times. YouTube: “Lihong Wang: World’s fastest camera for ultrafast phenomena provides temporal information” (published March 20, 2017). 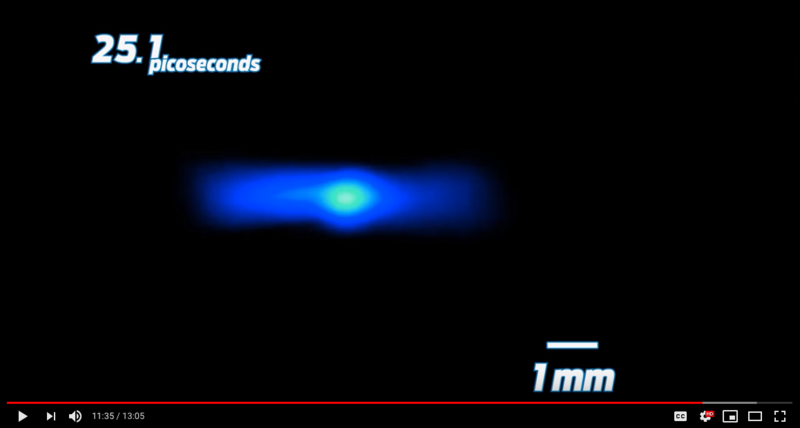 Photonic version of Mach cone — using laser light to image light propagating in a background medium. [From transcript, somewhat reconstructed.] If we have a background medium of some sort, the speed of light will be reduced in that medium relative to the speed of light in vacuum. We created a tunnel where the speed of light in that tunnel is greater than the speed of light in a medium. We propagate a light pulse — a very short light pulse — in that medium … [which] scatters within the tunnel [and] generates secondary light sources and those light sources will be propagated in the background medium; so, the light source will propagate at a greater speed and that creates a superluminal light source. YouTube: TED “Imaging at a trillion frames per second | Ramesh Raskar” (published on Jul 26, 2012). 1. Who … was his audience? These people just saw the speed of light, the fastest speed there is in our world. And they saw it slowed down enough to see it move in SLOW MOTION! Do they not understand what they just saw? The audience at the iPhone 5 [event] was more excited than these people. This is easily one of the most incredible advances in science! The ability to see the speed of light… it’s pretty … awesome people, get hype! 3. I think some of you may be a little bit misled by this video. You are not seeing a particular beam of light move through a particular bottle in a single event. You are seeing the motion of light of that particular circumstance. 4. It took thousands of measurements over several minutes, hours, or days to compile that short clip. Never the less, the clip does show the movement of light and it is backed by data. A picosecond is an SI unit of time equal to 10−12 or 1/1,000,000,000,000 (one trillionth) of a second. Chirped pulse amplification (CPA) is a technique for amplifying an ultrashort laser pulse up to the petawatt level with the laser pulse being stretched out temporally and spectrally prior to amplification [thereby avoiding problematical nonlinear effects impacting the beam or laser’s components]. Chirped-pulse amplification was originally invented as a technique to increase the available power in radar in 1960. CPA for lasers was introduced by Gérard Mourou and Donna Strickland at the University of Rochester in the mid 1980s, a work for which they received the Nobel Prize in Physics in 2018. In CPA … an ultrashort laser pulse is stretched out in time prior to introducing it to the gain medium using a pair of gratings that are arranged so that the low-frequency component of the laser pulse travels a shorter path than the high-frequency component does. After going through the grating pair, the laser pulse becomes positively chirped, that is, the high-frequency component lags behind the low-frequency component, and has longer pulse duration than the original by a factor of 1000 to 100000. Then the stretched pulse, whose intensity is sufficiently low compared with the intensity limit of gigawatts per square centimeter, is safely introduced to the gain medium and amplified by a factor of a million or more. Finally, the amplified laser pulse is recompressed back to the original pulse width through the reversal process of stretching, achieving orders of magnitude higher peak power than laser systems could generate before the invention of CPA. In addition to the higher peak power, CPA makes it possible to miniaturize laser systems (the compressor being the biggest part). A compact high-power laser, known as a tabletop terawatt laser (T3 laser), can be created based on the CPA technique. An international collaboration led by DESY and consisting of over 120 researchers has announced the results of the first scientific experiments at Europe’s new X-ray laser, European XFEL. The 3.4 kilometres long European XFEL is designed to deliver X-ray flashes every 0.000,000,220 seconds (220 nanoseconds). To unravel the three-dimensional structure of a biomolecule, such as an enzyme, the pulses are used to obtain flash X-ray exposures of tiny crystals grown from that biomolecule. Each exposure gives rise to a characteristic diffraction pattern on the detector. If enough such patterns are recorded from all sides of a crystal, the spatial structure of the biomolecule can be calculated. The structure of a biomolecule can reveal much about how it works. … every crystal can only be X-rayed once since it is vaporised by the intense flash (after it has produced a diffraction pattern). So, to build up the full three-dimensional structure of the biomolecule, a new crystal has to be delivered into the beam in time for the next flash, by spraying it across the path of the laser in a water jet. Nobody has tried to X-ray samples to atomic resolution at this fast rate before. … To probe biomolecules at full speed, not only the crystals must be replenished fast enough—the water jet is also vaporised by the X-rays and has to recover in time. To record X-ray diffraction patterns at this fast rate, an international consortium led by DESY scientist Heinz Graafsma designed and built one of the world’s fastest X-ray cameras, tailor-made for the European XFEL. The Adaptive Gain Integrating Pixel Detector (AGIPD) can not only record images as fast as the X-ray pulses arrive, it can also tune the sensitivity of every pixel individually, making the most of the delicate diffraction patterns in which the information on the structure of the sample is encoded. Serial femtosecond X-ray crystallography (SFX) is a powerful method to determine the atomic structure of a sample, typically a biomolecule like a protein. It builds on classic crystallography, which was developed more than a century ago. … The brief, but extremely bright flashes of X-ray lasers like the European XFEL overcome two problems at the same time: They are bright enough to produce usable diffraction patterns even from the smallest crystals, and they are short enough to outrun the radiation damage of the crystals. A typical X-ray laser flash lasts only a few femtoseconds (quadrillionths of a second) and has left the crystal before it is vaporised. This “diffraction before destruction” method produces high-quality diffraction pattern even from tiny crystals. But as every crystal is vaporised in a single flash, a new crystal has to be X-rayed with every flash. Therefore, the scientists spray thousands of randomly oriented protein crystals into the path of the X-ray laser and record series of diffraction patterns until they have gathered enough data to calculate the protein’s structure with atomic resolution. So, in femto-photography, how many photons are in a laser pulse 1 millimeter (mm) in length, that is, in a 3.3 picosecond pulse? Regarding temporal coherence of lasers, LIGO uses a complex laser generation system to achieve required quality: LIGO’s Laser. Despite the purity and stability of the initial beam, uponexiting the HPO it is still not stable enough for use. LIGO’s laser needs to be 100-million times more stable than it is intrinsically. To achieve this unprecedented level of stability, the beam’s natural frequency variations (i.e. its inability to continually radiate a single, discrete color of light) and power fluctuations are mechanically reduced by about a factor of 100-million through a series of feedback mechanisms before the laser is used in the interferometer. This whole process is akin to tuning the world’s most complex piano. My posts Imaging a light pulse? and A photon’s frame of spacetime — no rest for the massless discussed the landscape of light speed. Live Science recently posted an article “Here’s What the Speed of Light Looks Like in Slow Motion” (March 29, 2019) about a visit to the Caltech lab by The Slow Mo Guys where light pulses can be visualized at 10 trillion frames per second. The article includes Gav and Dan’s video “Filming the Speed of Light at 10 Trillion FPS” — a quick overview of the complex equipment and visualization, each of which involved hours of processing — far from instant photography. While the camera on your phone takes two-dimensional photos, T-CUP is a type of streak camera, which records images in a single dimension, very very quickly. Unlike prior streak cameras, which create composite images of light by recording different horizontal slices of laser over multiple laser pulses, the T-CUP is able to image an entire laser pulse in a single frame. It does this by diverting the laser beam to two different cameras simultaneously, then using a computer program to combine the two images. Regarding my speculation that “there are signs that ‘quantum leaps’ do indeed take a slice of time (so there is some physical process in space-time),” I found this Phys.org article “The discrete-time physics hiding inside our continuous-time world” (April 15, 2019) interesting. The article also was a refresh on Markov chains. Wiki: A Markov chain is a stochastic model describing a sequence of possible events in which the probability of each event depends only on the state attained in the previous event. … it is common to define a Markov chain as a Markov process in either discrete or continuous time with a countable state space (thus regardless of the nature of time) … Markovian systems appear extensively in thermodynamics and statistical mechanics, whenever probabilities are used to represent unknown or unmodelled details of the system, if it can be assumed that the dynamics are time-invariant, and that no relevant history need be considered which is not already included in the state description. … The paths, in the path integral formulation of quantum mechanics, are Markov chains.